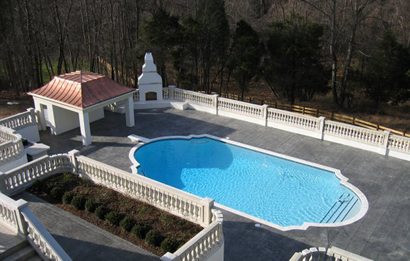 Pavers Driveways VA designs and installs new custom pools in Northern VA. Initial consultation to determine the scope and design of the pool will take place. Size, design, exact location, additional features (hot spas, waterfalls, etc) and overall pool project budget will be discussed before new pool construction. A Pavers Driveways VA representative will check with zoning to assure that all necessary setbacks and easements are in place for your site. An official plat plan of your property will be necessary. Owner should check with home owner association to obtain all necessary forms so that the proposed project can move forward. A grading plan of your property will be completed by our geo-tech engineer. This site plan will be submitted to the site division of your local county/city/town permit office. This process normally takes 3- 4 weeks to complete. Once the site permit is issued Pavers Driveways VA will apply for all necessary construction permits (building, electric, plumbing, gas). Site preparation begins. Pavers Driveways VA will check for public utilities, cap off any existing irrigation system, and relocate any plants as necessary. We will install a silt fencing around construction area. Set up a pre-construction meeting with the local permit office representative to preview the site and gain authorization to begin actual grading and excavation of site. Any grass, vegetation, or landscaping will be removed and hauled away as necessary. This will provide a clean surface for pool layout. The outline of your swimming pool will be spray painted on the ground per plan by a Pavers Driveways VA representative. This is the BEST time to make any changes or alterations to placement of the swimming pool or spa. Be sure this is what you want. This is your LAST chance to move the pool! Excavation will begin only after the owner gives full approval of the layout as marked. The swimming pool is excavated or dug. The actual hole will be 6” larger than the finished dimensions of the pool in all directions. 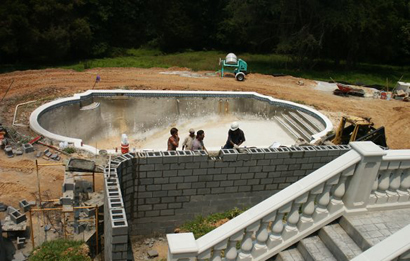 Forming material will be placed around the outer edge of the pool or spa. This ensures your bond beam dimension. This should be a 10” x 12” bond beam. If you want any dirt left on site be sure to arrange where it should be dumped and how much BEFORE excavation. Some areas of the country or your community are very rocky or have other hard dig soil conditions. 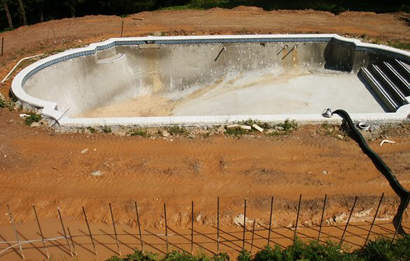 Your pool price is generally based on a standard dig. Non-corrosive schedule 40 PVC with schedule 40 fittings on the plumbing will be used throughout the pool. A vacuum breaker will be installed at the water source. The plumber will place and set the state of the art equipment per plan. 3/8” or 1/2”-diameter steel reinforced rebar will be placed throughout the pool structure. Rebars will be placed on the bottom of the pool, up the sides around the skimmer, and into the bond beam. Concrete spacers will be used so that the steel rebars are not against the wall or the floor of the pool. This system allows guniting to be evenly distributed under and above the steel. Wiring will be run from your electric panel to the equipment. Then from the equipment to lighting in the pool. Electric wiring and all grounding will meet and/or exceed National Electric Code standards. Ground fault interrupter devices will be installed for protection against electric fault. At this point a Pavers Driveway VA representative will arrange for a structural and electrical inspection of the site from your local building permit office. Guniting of the pool will be completed. 3500 to 4000 PSI Concrete will be pneumatically applied to create the pool shell and bond beam. Water curing is critical and will be done by spraying the pool shell with water up to 4 times a day for four days during warm and hot temperatures. Two or three times a day in cooler weather. This is done to prevent premature curing and to minimize shrinkage cracks in the gunite shell. Any special features (waterfalls, boulders, etc) will be installed at this time. The decking that surrounds your pool can be concrete, brick, stone, pavers or many other materials. All coping will cantilever 1 1/2” to 3 1/2” into the pool. Stone materials will vary in thickness. Concrete decking around the pool should be 4” minimum thickness. Expansion joints will be installed every ten feet to control any possible cracking of the concrete. Any deck shape changes, additional deck or deletions should be made at the time prior to forming of the deck. If tile is included in the design of your pool it will be installed at this phase. One row of 6×6 inch decorative tile will be installed around the pool perimeter and any other areas indicated on the design drawing. Small color tiles will be placed periodically on the steps and benches for safety to indicate depth changes in pool. All construction debris will be cleaned up in both the interior and the exterior of the swimming pool. Any tire tracks, dips where trenches were dug will be filled in. Clean-up is a preparation for the plastering phase and will be coordinated just prior to the plaster date. Pool safety barriers to deter children from entering the pool are required. Homeowner will need to choose barrier material (wrought iron, wooden fencing, chain link fencing). The barrier will be installed at this time. Plaster interior finish will be pneumatically applied in two coats then hand troweled to a non-slip waterproof surface. When the plaster is complete the crew will begin filling the pool and/or spa. Homeowner must have a garden hose available for the fill. Let the water run until the pool is in the center of the six-inch tile at the top edge of the pool. Turn the water off. Pavers Driveway VA can automate control of your pool. You can program your pool lights, pool heating, and pool cover, to operate at specific times of the day through your iphone or ipad. Security cameras can also be added to your pool automation package. When your pool is complete and filled to the proper level, a start-up professional will set up your pool equipment. At this time all equipment will be started, any detailing will be done and the cleaning system installed. Owner needs to be present about an hour later for instruction, explanation and demonstration for the new swimming pool.